The Middle Ages were a turbulent and violent time, when the fate of nations was most often decided on the battlefield, and strength of arms was key to acquiring and maintaining power. Feudal oaths and local militias were more often than not incapable of providing the skilled and disciplined warriors necessary to keep the enemy at bay. It was the mercenary who stepped in to fill the ranks. A mercenary was a professional soldier who took employment with no concern for the morals or cause of the paymaster. But within these confines we discover a surprising array of men, from the lowest-born foot soldier to the wealthiest aristocrat the occasional clergyman, even. What united them all was a willingness, and often the desire, to fight for their supper. 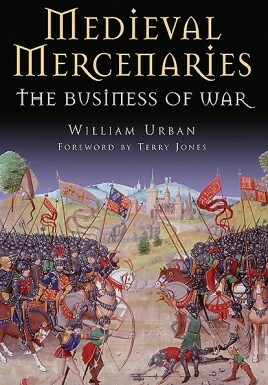 In this benchmark work, William Urban explores the vital importance of the mercenary to the medieval power-broker, from the Byzantine Varangian Guard to fifteenth-century soldiers of fortune in the Baltic. Through contemporary chronicles and the most up-to-date scholarship, he presents an in-depth portrait of the mercenary across the Middle Ages. "Mercenary armies were a common thing in the Middle Ages and the Renaissance. In this fascinating book based on contemporary chronicles and the latest research, William Urban tells the tumultuous story of soldiers of fortune at the service of various rulers. swarming anecdotes, the book offers an immersion into the complex and precarious world of professional soldiers whom war was primarily a matter of profit. It provides many individual portraits of mercenaries and studies their presence in works of writers as well known as Geoffrey Chaucer or Arthur Conan Doyle."